Good Enough is Good Enough, the law of diminishing returns. Before I start this is not a rallying call for mediocrity or dumbing down. There are many people with deeply held views on ‘good enough is not good enough’. I’d prefer not to offend them. This a post prompted by frustration. Frustration at the ‘pursuit of perfection’, and how it slows down getting things done. Just to illustrate, imagine this scenario. You need approval on a business case to start a low value pilot project. People up the chain keep returning the business case and asking for: more data, more detail on the return on investment, greater clarity on risks and absolute certainty on the outcomes and impact. All useful stuff but there has to be a cut-off point where good enough is good enough. The same applies if you a writing up a report. At what point does the effort you put in exceed the impact? Here are a few thoughts about written communication (mainly reports) and what ‘good enough’ means. Why do reports need to be good enough? People need to understand the message. This is the most basic reason for writing the report. If you don’t achieve this you might as well not bother. It needs to be accessible so that the reader will engage. By this I mean; layout on the page, use of data/graphics/images, font size/type, sentence length, grammar, spelling etc. There is nothing like densely packed monolithic blocks of badly written text to switch off lots of people. There are many variations of what could be done. I’d argue that the shorter and more straightforward something is, the easier it is for people to understand and quicker to implement. It’s a power game. Messing about with what someone else has written can be a massive ego trip for some people. It puts off decision making. People are just covering up their inability to make a decision under the smoke screen of ‘seeking perfection’. Massage egos. This is where ‘good enough is good enough’ really has benefits. You know things will be changed by someone, no matter how hard you work on it. Just accept the situation, produce good enough reports and shovel them up the line. At least that keeps things moving and the people making the changes think that they are doing something useful and making a difference. Draw a line in the sand. If someone is pursing perfection because they cannot make a decision just say, ‘no more amendments’. Easier said than done, but you might have to back this up with some numbers like how you have exceeded the cost benefit ratio through excessive administration costs (they like that sort of stuff). Better still say you will accept the blame for anything that goes wrong. The world of IT Management describes this concept as The Principle of Good Enough (POGE). This article by Scott W. Ambler talks about the idea of Just Barely Good Enough in the context of agile project management. The graph he uses is a development of the Law of Diminishing Returns, something which is well worth reviewing if you’re stuck in a ‘pursuit of perfection loop’. The article does point out the there is no simple mechanical method of knowing when something is good enough. Good enough will be dependent upon; the situation, it will change with time and it is achieved sooner than you think. At the end of the day it’s a judgement call. The important thing to remember is that ‘good enough’ does not represent low quality. Pursuit of perfection can be a behaviour that creates delay by putting off having to make a decision. The good enough approach needs to reflect the situation and can change with time. Accept that some people like to change reports. Produce something that is ‘good enough’ and move it up the line to get closer to action. Excellent: thanks. I curse whoever taught me that it was a Good Thing to be a prefectionist. Work, being a parent: it is so not and yes leads to procratination, frustration and upset. Trying very hard to accept good enough. Like Phil, I worked with a colleague a while back about a similar themed-blog. One response posted highlighted a mantra their school teacher had lived by, that ‘Good enough seldom is’. It made me laugh. The reality is balance and your post is a good prompt to remind of of the context. As part of my 2013 approach to social media and blogging I committed near the start of the year to Reblog once every month, sharing others’ musings, experiences and writing. 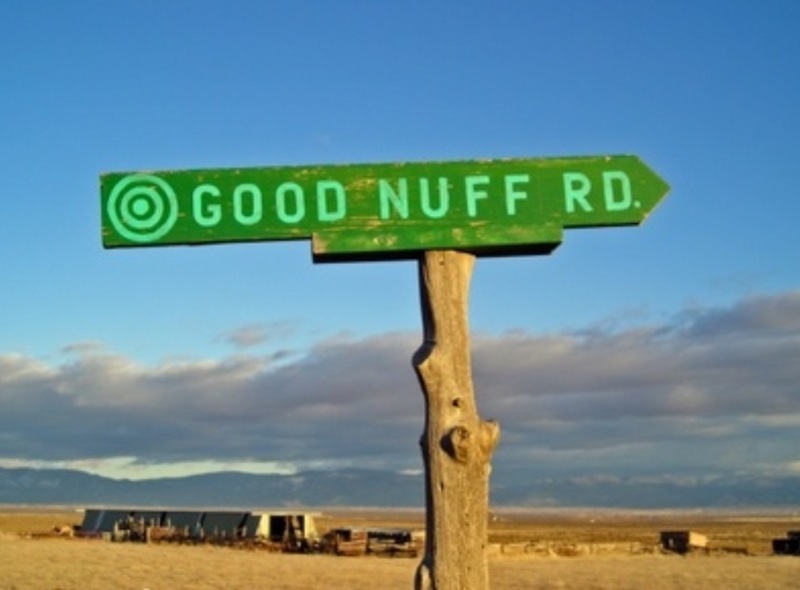 ‘Good Enough is Good Enough’ is the Blether And Blogger March 2013 Reblog. I chose Chris’s post because it made me think; it was a conundrum I resonated with, indeed I think we all have experienced this challenge no matter what path in life we have taken; and because I simply enjoyed reading it. Hope you do too. Kenny. Your thoughts are mine explained eloquently. I left my job 8 years ago for a number of reasons but one of them was a boss who constantly sought additional statistical information from me whenever a wrote up a proposal. Not only did he not recognise “good enough” he didn’t recognise ability based on experience and imagination. He was the school of thought that believed everything could be weighed in numbers. Didn’t Einstein say what counts can’t always be counted? Or words to that effect. Great point, that is precisely what I had experienced and thought about as well. I also add to it the “moral” component: pursuing perfection at the expense of other good deeds can really be immoral, and a mis-allocation of resources. However, I still believe that professionals should go further in pursuing perfection in their respective areas than laypeople, but even for them there must be a cut-off point. Voltaire argued that “best is the enemy of good”. 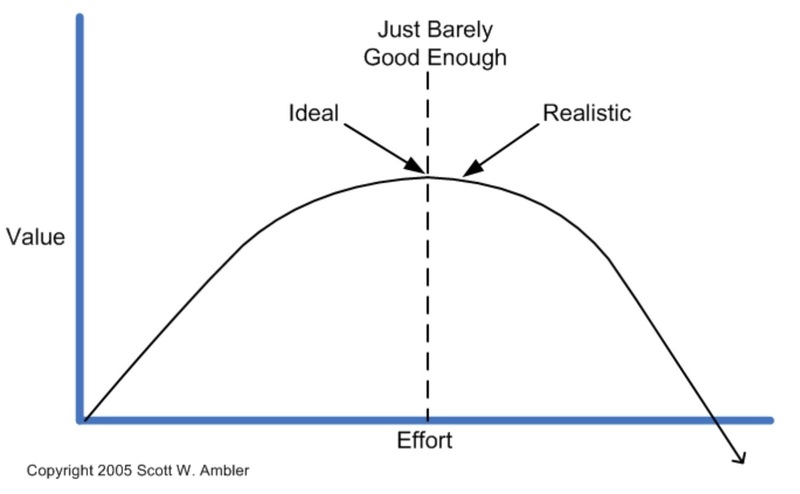 I always understand that as ‘good enough’ probably the ‘realistic’ point on the graph. It’s not wise to scrape by. Clear the bar clearly but not by a mile. It’s related to the Pareto principle (the 80-20 rule). It’s all part of the Law of Diminishing Returns/Utility which ever way you want to look at it. I have this idea that the bar is in fact lower for data quality in decision making for two reasons. You can use decision boundaries and error-bars to make decisions whilst still holding only approximate data. For other processes there is no such analogy.